DNA computing is the idea of using chemical reactions on biological molecules to perform computation, rather than silicon and electricity. We often hear about quantum computers, and there is a lot of discussion about whether it will actually work, or crack RSA, stuff like that. In the domain of alternative computers, DNA computers are often overlooked, but they’re easy to understand (none of the quantum weirdness), and have potential to do massively parallel computations efficiently. I first heard about DNA computers when doing my undergrad research project this term. I won’t bore you with the details, but it has to do with the theoretical aspects of DNA self-assembly which we will see is related to DNA computing. The study of DNA computing is relatively new: the field was started by Leonard Adleman who published a breakthrough paper in Science in 1994. In this paper, he solved the directed Hamiltonian Path problem on 7 vertices using DNA reactions. This was the first time anything like this had been done. In this article, I will summarize this paper. DNA is a complicated molecule with a lot of interesting properties, but we can view it as a string over a 4 letter alphabet (A, C, G, T). Each string has a Watson-Crick complement, where A is complement to T, and C is complement to G.
Without delving too deep into chemistry, I’ll describe some of the operations we can do with DNA. 1. Synthesis. We can use a machine to create a bunch of single DNA strands of any string we like. The technical term for these is oligonucleotides, but they’re just short DNA pieces. One limitation is we can only make strands of 20-25 nucleotides with current lab techniques. 2. Amplify. Given a test tube with only a few strands of DNA, we can amplify them into millions of strands using a process called polymerase chain reaction (PCR). 3. Annealing. Given a test tube with a lot of single stranded DNA, cooling it will cause complementary strands to attach to each other to form double strands. 4. Sort by length. By passing an electrical field through a solution, we can cause longer DNA strands to move to one side of the solution, a technique called gel electrophoresis. If desired, we can extract only strands of a certain length. 5. Extract pattern. Given a test tube of DNA, we can extract only those that contain a given pattern as a substring. To do this, put the complement of the pattern string into the solution and cause it to anneal. Only strands that contain the pattern will anneal, and the rest can be washed away. This list is by no means exhaustive, but gives a sample of what operations are possible. The Directed Hamiltonian Path problem asks, given a directed graph, does there exist a path from s to t that goes through all the vertices? For example, in this graph, if s=1 and t=3, then 1->4->2->3 is a directed Hamiltonian path. This problem is related to the Travelling Salesman Problem, and is particularly interesting because it is NP-complete, so conventional computers can’t solve it efficiently. It would be really nice if DNA could solve it better than normal computers. Here I’ll describe the process Leonard Adleman performed in 1994. He solved an instance of Directed Hamiltonian Path on 7 vertices, which is obviously trivial, and yet this took him 7 days of laboratory time. Early prototypes often tend to be laughably impractical. Main Idea: we represent each vertex as a random string of 20 nucleotides, divided into two parts, each of 10 nucleotides. We represent a directed uv-edge by taking the second half of u and the first half of v, and taking the complement of all that. When we put all the vertex and edge strands into a test tube, very quickly the solution will anneal (and not just one, but millions of copies of it). However, the test tube also contains all kinds of strands that don’t represent Hamiltonian paths at all. We have to do a tricky sequence of chemical reactions to filter out only the DNA strands representing valid solutions. Step 1. Keep only paths that start on s and end on t. This is done by filtering only strands that start and end with a given sequence, and this is possible with a variation of PCR using primers. Step 2. Sort the DNA by length, and only keep the ones that visit exactly n vertices. Since each vertex is encoded by a string of length 20, in our example we would filter for strands of length 80. Step 3. For each vertex, perform an extract operation to filter only paths that visit this vertex. After doing this n times, we are left with paths that visit every vertex. This is the most time consuming step in the whole process. Step 4. Any strands remaining at this point correspond to Hamiltonian paths, so we just amplify them with PCR, and detect if any DNA remain in the test tube. If yes, there exists a directed Hamiltonian path from s to t in the graph. That’s it for the algorithm. Adleman went on to describe the incredible potential of DNA computers. A computer today can do about operations a second, but you can easily have DNA molecules in a test tube. Shortly after Adleman’s paper, researchers applied similar ideas to solve difficult problems, like 3-SAT, the maximal clique problem, the shortest common superstring problem, even breaking DES. Usually it was difficult to implement these papers in the lab, for example, Richard Lipton proposed a procedure to solve 3-SAT in 1995, but only in 2002 did Adleman solve an instance of 3-SAT with 20 variables in the lab. On the theoretical side, there was much progress in formalizing rules and trying to construct “universal” DNA computers. Several different models of DNA computing were proven Turing complete (actually my research adviser Lila Kari came up with one of them). It has been difficult to build these computers, because some of the enzymes required for some operations don’t exist yet. There has been progress on the practical side as well. Since Adleman, researchers have looked into other models of using biological molecules for computation, like solving 3-SAT with hairpin formation or solving the knight’s tour problem with RNA instead of DNA. In 2006, a simplified DNA computer was built that had the ability to detect if a combination of enzymes were present, and only release medicine if they are all present (indicating that the patient had a disease). In 2013, researchers built the “transcriptor”: DNA versions of logic gates. One reason these are important because transcriptors are reusable, whereas previously all reagents have to be thrown away after each operation. Clearly, the method I described is very time consuming and labor intensive. Each operation takes hours of lab work. This is not really a fundamental problem, in the future we might use robots to automate these lab operations. The biggest barrier to solving large instances is that right now, we can’t synthesize arbitrary long strands of DNA (oligonucleotides). We can synthesize strands of 20-25 nucleotides with no problem, but as this number increases, the yield quickly becomes too low to be practical. The longest we can synthesize with current technology is a strand of length about 60. (Edit: Technology has improved since the papers I was looking at were written. According to my adviser, we can do 100 to a few thousand base pairs now in 2016). Why do we need to synthesize long oligonucleotides? To represent larger problem instances, each vertex needs a unique encoding. If the encoding is too short, there will be a high probability of random sections overlapping by accident when they’re not supposed to, thereby ruining the experiment. One promising direction of research is DNA self-assembly, so instead of painstakingly building oligonucleotides one base at a time, we put short strands in a test tube and let them self-assemble into the structures we want. My URA project this term deals with what kind of patterns can be constructed with self-assembly. Today, if you need to solve a Hamiltonian path problem, like finding the optimal way to play Pokemon Go, you would still use a conventional computer. But don’t forget that within 100 years, computers have turned from impractical contraptions into devices that everyone carries in their pockets. I’ll bet that DNA computers will do the same. Adleman, Leonard. “Molecular computation of solutions to combinatorial problems“. Science, volume 266, 1994. Lipton, Richard. “DNA solution of hard computational problems“. Science, volume 268, 1995. About two years ago, when I was in grade 9, I decided to make a tetris clone in Java. One or two months later, I had a fully working and playable tetris, complete with background and sound effects and scoring and graphical effects when a line is cleared. A year after I created it, I decided to go ahead and write an AI to play my game. 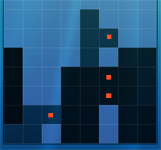 Although it played much better than I could (I’m not a particularly good tetris player), it would still die after a few dozen lines when the number of columns is 10. This means it was pretty outclassed by existing AI’s that could go on for thousands of lines! How does one make a computer program to play tetris? Or more generally, how does one play tetris in the first place? The rules of tetris seem to me to be better viewed than explained, but I’ll give a quick overview of tetris gameplay and tetris strategies. If the blocks don’t get cleared and they stack to the top of the board, you lose. So ideally you want to fill as many lines as possible and avoid stacking the blocks up. Very simple. So for each position the computer can calculate a height penalty — for each block the computer adds a number depending on how high it is. Then when the AI tries to decide where to put the next block, it ‘knows’ that blocks piled up really high is a bad thing and tries to avoid it. Another strategy that seems pretty obvious is to try to get clears! We assign a positive score for each line we clear, in other words we reward clears. Duh. Why don’t we want holes? A row is only considered a clear if the entire row is filled — if there’s even a single hole in the row, it doesn’t get removed. Not good. So it makes sense to give a negative score to positions with holes in them — to penalize holes. Why are blockades bad again? Well, a hole only stops being a hole if there are no more blocks above it, so stacking more blocks above holes would only make it harder to remove the hole. These are all the obvious strategies. I also put in less obvious scores rewarding or penalizing for hugging the wall (edge of the current block touching edge of the wall), hugging the floor (edge of current block touching the floor) and flattening (rewarding if the edge of the current block touches an existing block). Again, these are harder to justify and mostly for fine-tuning — it’s not even clear whether they should be positive or negative. Look at the current block and the next block and simulate ALL possible combinations (positions and rotations) of the two blocks. Calculate a score for each of the positions. Move the block to the position with the highest score and repeat. The reason I gave such a low multiplier for the height is because the numbers stack up so quickly it racks up a huge penalty for each block on the field. The numbers I chose seem pretty reasonable — and puts blocks more or less where a human would put them. The biggest problem with this method is that we choosed the weights pretty much arbitrarily. They might work well or they might not, but we don’t really know whether there are better values for them. What can we do about it? We could brute force it — but with solutions that range across a continuum, there is a better way — a genetic algorithm. A genetic algorithm is just a searching heuristic; it derives its ideas from evolution, where nature creates complex and sophisticated organisms by making random changes to the DNA. Variation: Organisms in a population must be slightly different from one another. Inheritance: Traits of parent organisms must be passed onto their offspring. Limited space: Only some of the offspring in any generation is able to survive and pass on its genes. Competition: Individuals that are more fit are more likely to pass on their genes to the next generation. We begin by constructing a chromosome — a solution to the problem of making an AI to play tetris. This is pretty easy, since we can already run an AI with a set of seven weights. So the chromosome is simply an array of seven doubles. Next, our fitness function is very easy too, since the AI already has a scoring system. Basically the program would run the tetris AI at max speed on a 8 column board until it died, after which it would use the score it earned. Why only 8 columns and not the normal 10? In later generations, AI’s are able to survive for hours in the 10 column version, but when we reduce the number of columns to 8, even the best AI’s can survive for only a few seconds to a minute (we’re still talking about hundreds or thousands of lines here). I used Nintendo’s original scoring system for tetris — 40 points for one clear, 120 points for two simultaneous clears, 300 for three simultaneous clears, and 1200 for four simultaneous clears. I also added 1 point for each block placed, to differentiate between AI’s that couldn’t score any lines. Three, I chose a population of sixteen chromosomes. Initially the chromosomes are filled with randomly generated numbers (floating points fitting a normal distribution). Each generation onwards, the population’s chromosomes are derived from the best candidates of the previous generation (more on this later) — but the population size stays the same. Next, for the selection method I chose a simple tournament method. After we run each candidate from a generation and collect all of their scores, we randomly pair up the candidates. For each pair, we take the high scorer — the winner — and discard the low scorer. Then, we pair up the winners randomly again to generate new offspring for the next generation. Lastly, I implemented the crossover as follows: for each of the seven attributes in the offspring’s chromosome, we randomly select the respective attribute from the two parents with equal probability. Occasionally, we have a mutation — a trait in an offspring that does not come from either parent. Each time we give an offspring an attribute, we have a 10% chance of assigning a completely random value to that attribute instead. Whoa — that’s a huge height multiplier. Perhaps the multiplier is so big that it just overwhelms everything else in the list — remember that the height multiplier applies to every block on the field. Also, holes and blockades might not have been as bad as I thought — and what’s with the huge bonus for touching the wall? Yup, this one rewarded blockades and penalized clears. And it would outperform both my naive values and the first set of AI values — I used this set in the video. It seems to put blocks in really bad positions, creating holes and blockades when it is unnecessary to — but it still does better than anything else I have. What I said about the height multiplier overwhelming everything else is a bit misleading. While it is true that the height multiplier itself applies to every block on the field, it doesn’t really work that way, and really only affects the current block. Reason being, the rest of the field — everything but the current block — stays constant no matter where the current block goes. It’s kind of like if you vote for everybody, you really vote for nobody as your votes have no effect on the outcome. The lines cleared factor also turned out to be a bit misleading. While the second AI had a negative weight for clearing a line, it still cleared lines whenever it could: again tying back to the height multiplier. Clearing a line does exactly what it says: removing an entire row of blocks — and removing that many blocks does a huge blow to the height multiplier. The fitness function was really kind of screwed up. By the time your AI’s can get a few thousand lines on a tiny 8-column board, the only thing that causes the AI to die is a bad sequence of hard-to-place S and Z blocks — and in any random number generator you’ll eventually get a series of unlucky blocks. So at later generations, simply simulating a 8 column tetris was fairly bad at separating the very good AI’s from the excellent AI’s. Selection was also a bit screwed up. After ten generations, the entire population had more or less the same values, with only some minor variations — a bit ironic since this situation was exactly the situation the tournament selection algorithm was supposed to prevent. Although a genetic algorithm can converge on a local optimum fairly quickly, producing a decent solution, it is very hard for it to achieve a global optimum — the best possible solution. You might have a situation where mutating any one value seriously harms the candidate, but mutating two or more values simultaneously in a certain way makes it better. This is a drawback for genetic algorithms in general. So that’s all I have to say. I’m fairly new to genetic algorithms, so I may have botched one or more parts of the algorithm. I’d love to know what I did wrong and how I should’ve done better. Further discussion on Reddit and in the comments below!